Yale, Charleston, HWS, Navy and Brown take regatta wins as the team race season, coed and women’s, heats up! Brown University won the Duplin Women’s Team Race at Tufts University in Larks on Mystic Lake. Like most New England regattas, the Duplin was a one day event. Brown went 10-0 after a full 8-team round robin and a top-4 round robin. Brown likely would have been most people’s betting favorite as their top team race team features Hannah Steadman and Ragna Agerup- two of the best women’s sailors in the nation. However, Brown’s undefeated effort showed their depth as it featured none of the aforementioned women. Brown sailed Rachel Foster ‘20, Sophie Hibben ‘19 and Olivia Belda ‘22 on the tiller with Maxine De Havenon ‘19, Emma Montgomery ‘22, Abigayle Konys ‘19 and Annabelle Hutchinson ‘21 in the front. 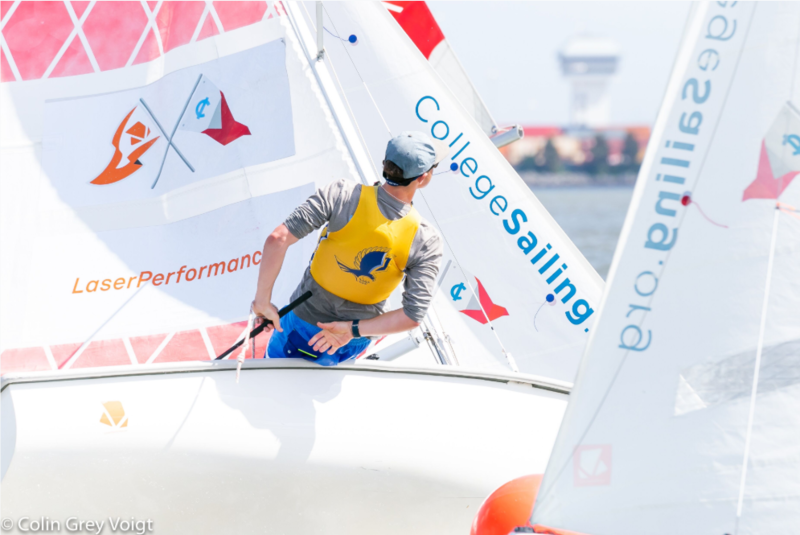 “The timing of the Duplin is best for all the very fast women’s sailors who are asked to team race in practice against their “A” teams during spring break. 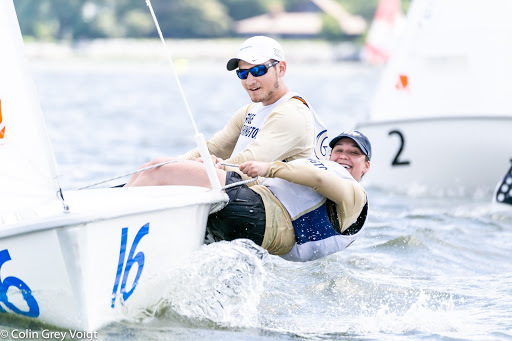 The low-key but high level sailing at the Duplin is their reward,” finished Coach Legler who is also a terrific photographer and keeper of sailing history. Boston College finished second at 7-3 and Boston University finished 3rd at 5-5, winning a tiebreaker over University of South Florida. The Duplin was not the only Women’s Team Race last weekend. The Seahawk Women’s Team Race was taken by Navy and a 10-5 record, besting University of Pennsylvania who finished with a 9-6 record. Navy started slow, finishing the first round robin with a 2-3 record. 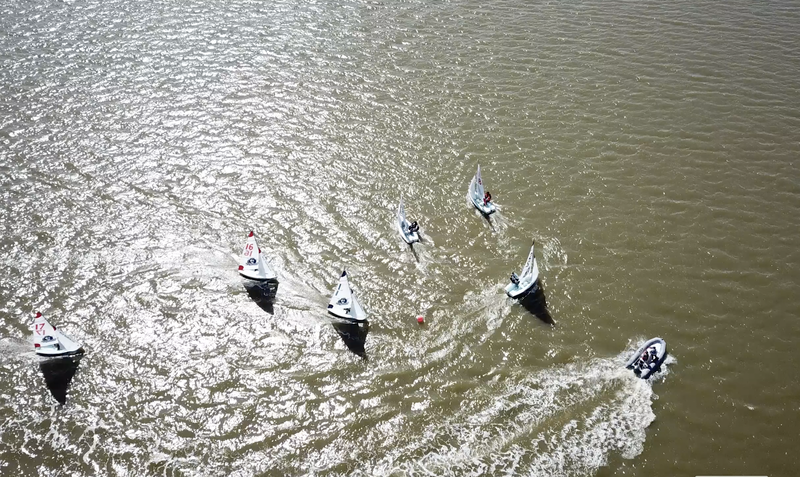 They turned it on thereafter as they finished the regatta only dropping two races in the final 10 sailed. Navy sailed Olivia de Olazarra ‘22, Jessica McJones ‘20 and Brittany Slook ‘20 with Madeline Pruzan ‘21, Kelly Milliken ‘21 and Fiona Lobon ‘22 as crews. The regatta was shortened due to big breeze and cold water temps on Saturday, limiting the regatta to a one day, one round robin format. Yale started their usual group plus a coupe more crews for the wide range of conditions. Nic Baird ‘19, Nick Hernandez ‘19, Shawn Harvey ‘21, Sonia Lingos-Utley ‘21, Graceann Nicolosi ‘20, Claudia Loiacono ‘21 and Catherine Webb ‘22 were joined by stars on the women’s circuit, Catherine Mollerus ‘21 and Christine Klingler ‘20 to add depth to an already deep and talented squad. Though the Bulldogs’ top squad has yet to finish worst than first at a team race regatta this season, carrying a 38 win and 5 loss record so far, they did appear to be beatable at the Friis, losing twice- once decisively to Dartmouth who finished that race in a 1-2-4 combination and the event in 4th (more on that later,) and to Boston University in what looked to be a sketchy 1-3-5 finish in favor of the Terriers. Yale seems to be the most refined team in the nation but there are more than a few teams knocking on their door. Dartmouth finished 4th after losing a sailoff with Stanford University. Both teams finished with a 6-3 record. 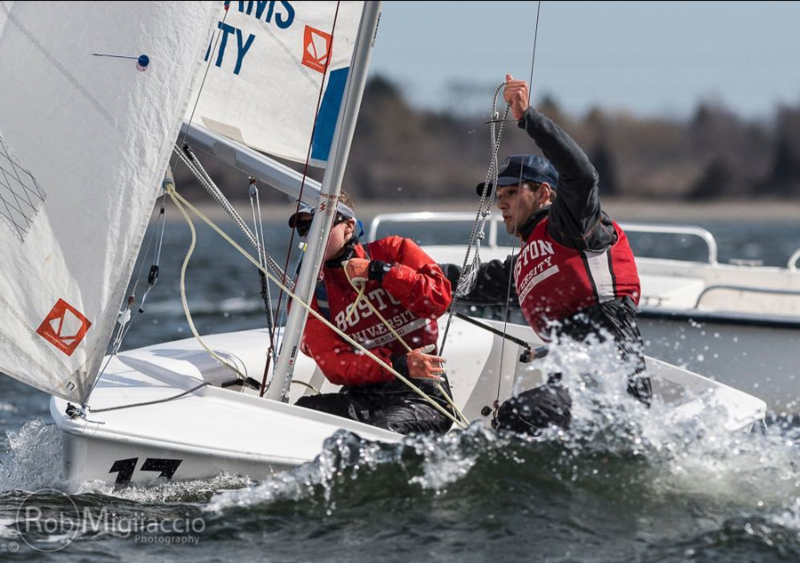 With two weeks to go before the Fowle Trophy, New England’s Team Race Championship and qualifier for nationals, the conference hierarchy is incredibly uncertain. Yale is the obvious favorite to come out of NEISA, but with Roger Williams, Bowdoin, Dartmouth, Boston College, Brown, Harvard, Tufts, MIT and Boston University all vying for the remained 3 qualifying berths, the NEISA Champs could be quite contentious. After a Friis Trophy where Roger Williams looked great and Dartmouth emerged from the White Mountains of frozen New Hampshire seemingly battle-ready, all eyes look to Boston and MIT for next weekend’s Lynne Marchiando Regatta as the last showdown and indicator of what’s to come in New England. College of Charleston won the Aaron Szambecki Team Race with a 18-3 record after two full 10 team round robins and a final four. The win at the Szambecki marks the first interconference team race win this season for Charleston as the newcomers are finding their stride alongside the incumbent Dale and Lounsbury. Charleston is trending up in a big way finishing 3rd at home at the Bob Bavier, 4th at the St. Mary’s Team Race, second at the Graham Hall before winning the Szambecki. The Cougars mixed it up again this regatta sailing Seven Leuck ‘20 and Jack Brown ‘21 with Carter Cameron ‘19, Annabelle Carrington ‘19, Hunter Skinner ‘20 and Payton Alexander ‘19 alongside Dale ’19 and Lounsbury ‘20. This group proved more than competent with Alie Toppa ‘20 back out of the rotation. However, with Toppa in the lineup, the Cougars finished 2nd at the Graham Hall- a deeper, more competitive regatta, just behind Yale. Coach Cromwell, again seems to have all the talent needed to make a run at Charleston’s third consecutive Team Race Championship. Charleston’s three losses came at the hands of Stanford in round two, Navy and George Washington in the final four after the Cougars went 9-0 in round one. Navy finished second at 16-5 while George Washington finished 3rd at 15-6. Hobart and William Smith Colleges won the Admiral Moore Team Race sailed at SUNY Maritime College. HWS finished with a 9-1 record in the single day regatta cut short, like many regattas in the northeast, due to high winds and cold water. HWS sailed a pretty tight group as their championship lineup is starting to emerge. Hector Guzman ‘20 and Charles Miller ‘19 on the tiller has been a staple for their success for a while now. As is the case with Maya Weber ‘20 and Lindsey Kloc ‘19. However, the emergence of Kyle Easton ‘20 and Aiden Morgan ‘21 looks to provide stability for a team now with its eyes on a Mid-Atlantic Championship. After losing their first matchup against Fordham, HWS ended the regatta on a 5 race winning streak, including a redeeming victory over Fordham. Fordham’s success in this event earned the Rams a trip to the MAISA Championships, The Prosser Trophy. Fordham, along with HWS, Georgetown, ODU, George Washington and Navy prequalify, leaving St. Mary’s, Cornell, University of Pennsylvania, Christopher Newport University, SUNY and KP fighting for the final 2 spots at the Team Race Challenge, just to have a shot at being one of the 4 that MAISA will send to the Laser Performance National Championship May 25-27. Fordham finished 8-2 with Roger Williams rounding out the top 3 at 5-and-5, winning a tie-break against University of Pennsylvania.